I came across slate tool when I was looking for API documentation generator for our webservice API. I am the big fan of Markdown and I was looking for a tool like this for writing a documentation. Slate requires Ruby 1.9.3 and newer. Run rake build to generate documentation locally or rake publish for deploying to remote server (you may need an extra setup). See the slate wiki for more details. builder.say_status "PDF Maker",  "PDF file available at build/api.pdf"
As you can see, PDFKit and subsequently wkhtmltopdf is used under the hood. Notice pdfkit-footer_* meta tags here. Squid combines greatly with salted ghee. I hope this little instruction will help you to generate a PDF version of your API. Aglio. It renders API documentation in API Bluepring format to Beautiful sites. Swagger UI. It allows to generate REST API documentation from Java sources. 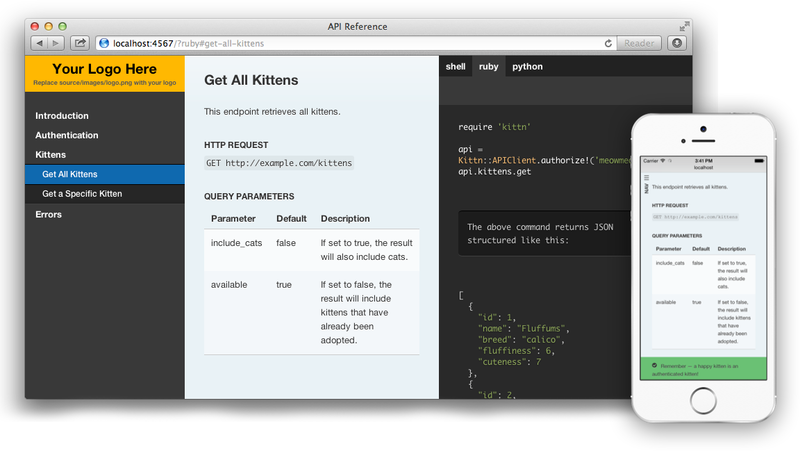 See the article, API documentation example. http://jsondoc.org/ - Java java library useful to build the documentation of your RESTful services. Can be used to generate a static site.